Color: Turquoise The GreenLife soft grip in one word? handy! these lightweight pans have asolid base which offers good heat distribution and guarantees stability. Theergonomic bakelite handles feel soft to the touch and stay cool, no matterwhat. In addition, the Thermolon ceramic non-stick coating makes cooking easyand the ceramic aluminum body makes cleaning a breeze. 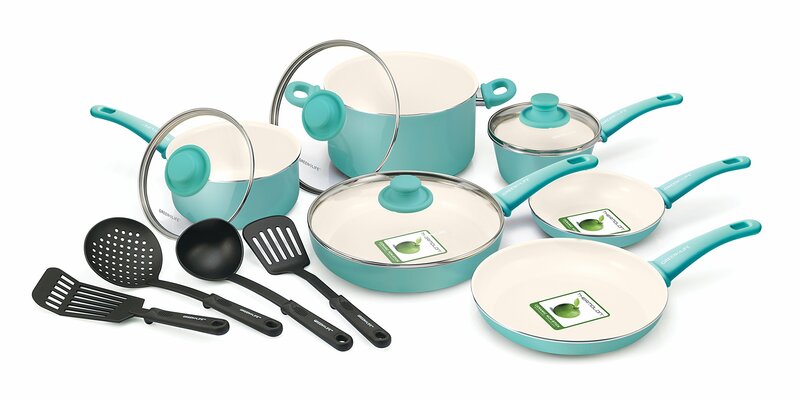 Roasting, braising,making sauces: the soft grip in striking turquoise is your ideal handy helperin the kitchen! set includes: 7" open frypan, 9.5" Open frypan, 1qt coveredsaucepan, 2qt covered saucepan, 5qt covered casserole, 2.5qt Covered sautepan, 4 nylon utensils.